Bobby Robinson, whose tiny record shop on Harlem‘s 125th St. spawned No. 1 national hits and made him an uptown patriarch for six decades, died yesterday. 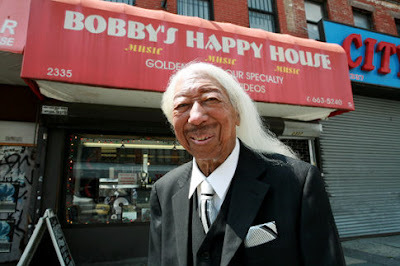 The musician, personality and business owner owned Happy House Records for more than 60 years. He was 93 and had been ill for several years – though he regularly went to work at his shop until it was forced to close in January 2008. Impeccably dressed, well-spoken and ambitious to make his mark in the entertainment business, Robinson opened Bobby’s Happy House in 1946. His shop was the first black-owned business on 125th St., and within five years he used it to launch a series of record labels. Sometimes working with his brother Danny, who also had an office on 125th St., Robinson recorded hundreds of artists from Gladys Knight and the Pips to Grandmaster Flash and the Furious Five. Knight’s first hit, “Every Beat of My Heart,” was released on Robinson’s Fury label. Robinson, a South Carolina native, had a No. 1 national hit in 1959 with Wilbert Harrison‘s “Kansas City” – and said years later that a hit of that magnitude crippled his business because he had to press so many copies he couldn’t promote any other artists. But his Red Robin, Whirlin’ Disc, Fire, Fury and Enjoy labels became legendary in the rhythm and blues world, and his releases by artists like the Channels, Teenchords and Scarlets helped define the sound of the New York streets through the 1950s. Robinson ultimately recorded a wide range of artists that included the great bluesman Elmore James, whom Robinson inducted into the Rock and Roll Hall of Fame. In the late 1970s, Robinson became one of the first label owners to record rap music, cutting artists like Flash, Doug E. Fresh and Spoonie Gee. Robinson eventually had to move the shop around the corner in the late 1990s, and he closed for good on Jan. 21, 2008, when his new landlord decided to raze the building for a development.